“When we witness something, are we responsible for what we witness?” poet Yusef Komunyakaa has asked. As a poetic tradition, perhaps “The Poetry of Witness,” a term coined by Carolyn Forché in her 1993 anthology Against Forgetting, has morphed into a new genre, aided by smart phone videos, YouTube, and Twitter. While the era of social media has allowed us to view the full scope of humanity’s triumphs and atrocities, it has also numbed us to the responsibility inherent in the act of witness. We can turn away from a beheading just as easily as we can witness one. But in witnessing these horrors, are we complicit in them, or like the characters in Auden’s “Musée des Beaux Arts,” taken from Brueghel’s painting Landscape with the Fall of Icarus, are we merely indifferent? Komunyakaa’s “ongoing existential question,” about the responsibility of bearing witness lies at the heart of Kirun Kapur’s debut collection of poems, Visiting Indira’s Gandhi’s Palmist, a book which wrestles with that question, even as it accepts that the answer is, ultimately, yes. “It doesn’t hurt / To be made of others’ sadnesses,” Kapur writes in one poem, although we understand by the end of the book that it does. Like the scar the speaker describes on her thumb in the title poem, this collection leaves its mark on the reader through poems that turn on the very act of looking itself. may be exaggerated. I stopped believing my eyes. Hot oil. Machetes. I watched with my own eye. though her name was Asha? I don’t know how to explain. All the women’s breasts cut off. I believe some reports were exaggerated. Given everything, how happy are you, on a scale of one to ten? What a phrase: given everything. Please answer on a scale of one to ten. Do you think you’ll ever be happy? What makes you think I’m not? What about joy? What about hope? What about mercy? Consolation? What about redemption in the face of history? I think that’s in a different book. The problem with bearing witness, Kapur implies, is that we bear witness to human history, and as humans we are both inextricably linked and irrevocably damned. “A family is a house full of mirrors,” she writes in “The History Family,” and in “Dog, Master,” she notes that “Whatever beat in us, beat and played / this way once.” Formally, disobedience beats in the heart of these poems, a barely contained rage augmented by the manipulation of poetic forms—the pantoum in particular—as though Bishop’s technical and descriptive genius had coupled with Plath’s ferocity to birth a new breed of postcolonial feminist poetry. In “Love Song (Surat, Gujarat, 1992),” for example, the assonance of the irregularly rhymed stanzas produces a tone reminiscent of Plath’s “Daddy,” while the “details” that “kill” the speaker in “My Brother’s Keeper,” bear the trace of Bishop’s “Filling Station”: “…Now you see, / it’s dirty work to make it shine.” But while Bishop concedes (ironically, perhaps) that “Somebody loves us all,” Kapur’s pronouncements are more austere. “You’ll say I’ve made love meaningless,” she writes. In her search for meaning behind the narratives of inheritance, Kapur renders the act of witness not only meaningful, but necessary. 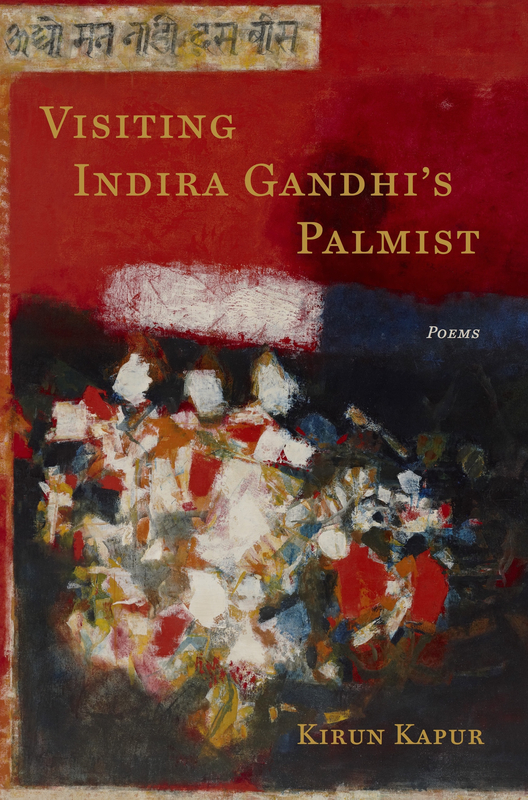 Kirun Kapur is the winner of the Arts & Letters Rumi Prize in Poetry and the Antivenom Poetry Award for her first book, Visiting Indira Gandhi’s Palmist (Elixir Press, 2015). Her work has appeared in AGNI, Poetry International, FIELD, The Christian Science Monitor and many other journals. She has taught creative writing at Boston University and has been awarded fellowships from The Fine Arts Work Center in Provincetown, Vermont Studio Center and MacDowell Colony. She is the founder and director of the New England arts program The Tannery Series and serves as Poetry Editor at The Drum Literary Magazine. Kapur grew up in Honolulu and now lives north of Boston. Elizabeth Knapp is the author of The Spite House (C&R Press, 2011), winner of the 2010 De Novo Prize for Poetry. The recipient of the 2007 Discovered Voices Award from Iron Horse Literary Review, she has published poems in Best New Poets 2007, The Massachusetts Review, Mid-American Review, Barrow Street, and many other journals. She holds an MFA from the Bennington Writing Seminars and a PhD from Western Michigan University and is currently Associate Professor of English at Hood College in Frederick, Maryland.